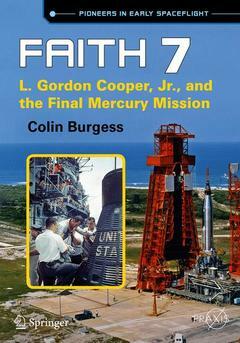 This book celebrates the final spaceflight in the Mercury series, flown by NASA astronaut Gordon Cooper, who led an adventurous life in the cockpit of airplanes and spacecraft alike, and on his Mercury mission he became the last American ever to rocket into space alone. He flew in the Mercury and Gemini programs and served as head of flight crew operations in both the Apollo and Skylab programs. Based on extensive research and first-person interviews, this is a complete history of the Faith 7 flight and its astronaut. Cooper later gained notoriety following the release of the movie, The Right Stuff, in which he was depicted by Dennis Quaid, but Burgess discovers there was even more drama to his story. It completes the "Pioneers in Early Spaceflight" subseries in fitting fashion. Foreword by Alfred Worden (CMP Apollo 15).- Acknowledgements.- Author Prologue.- Chapter 1: An astronaut from Oklahoma.- Chapter 2: The final Mercury mission.- Chapter 3: One reckless act.- Chapter 4: A day in space with Faith 7.- Chapter 5: “A victory for the human spirit”.- Chapter 6: The end of the Mercury era.- Chapter 7: From Gemini to Apollo.- Chapter 8: “The greatest pilot you ever saw”.- Appendices.- Index. Colin Burgess’s first book, “The Diggers of Colditz” was published simultaneously in the U.K. and Australia in 1985. His next few books were on the Australian prisoner-of –war experience and then he turned his efforts to writing about his principal interest: human space exploration. Colin has written a number of books on the subject for the University of Nebraska Press and Springer-Praxis. The books he has written or co-authored for Springer-Praxis are “NASA’s Scientist-Astronauts,” “Animals in Space,” “The First Soviet Cosmonaut Team,” “Selecting the Mercury Seven,” “Moon Bound,” “Freedom 7,” “Liberty Bell 7,” “Friendship 7,” “Aurora 7,” and “Sigma 7”. Colin also wrote “Interkosmos” (2016) with co-author Bert Vis, and a history of NASA’s Group 5 and 7 astronauts with co-author David J. Shayler. In addition, he is the series editor and sometimes author for the Outward Odyssey series of books on the social history of space exploration for the University of Nebraska Press.